2. The night before: Soak beans in cold water in center crock of slow cooker. Cover and soak overnight. 3. In the morning: Turn slow cooker to high. Chop onion and add to pot as you chop. Add the following to pot in this order; salt, pepper, brown sugar, mustard, vinegar, molasses, ketchup, chili paste, and maple syrup. 5. Lay bacon on top and cover with lid. 6. Reduce heat to low and set timer for 7 hours. 7. 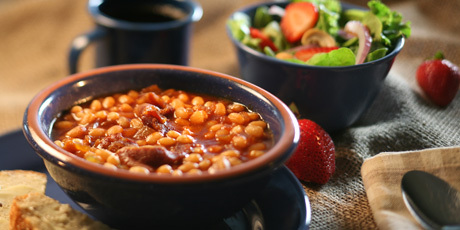 When you arrive home set oven to 350ºF: Remove 1 cup of cooked beans from pot, mash and gently stir back into the pot. 8. Add water if beans seem too dry (but only a tiny bit at a time). Stir. 9. Turn oven off and pop bread in to warm. 1. Rinse spinach leaves and leaf lettuce in a salad spinner and spin dry. 2. Sliver the red onion. 3. Wash and slice strawberries. 4. Divide spinach and lettuce on serving plates and top with onion and strawberries. 5. Top with dressing and scatter with cashews. 6. Serve with warm multigrain bread.